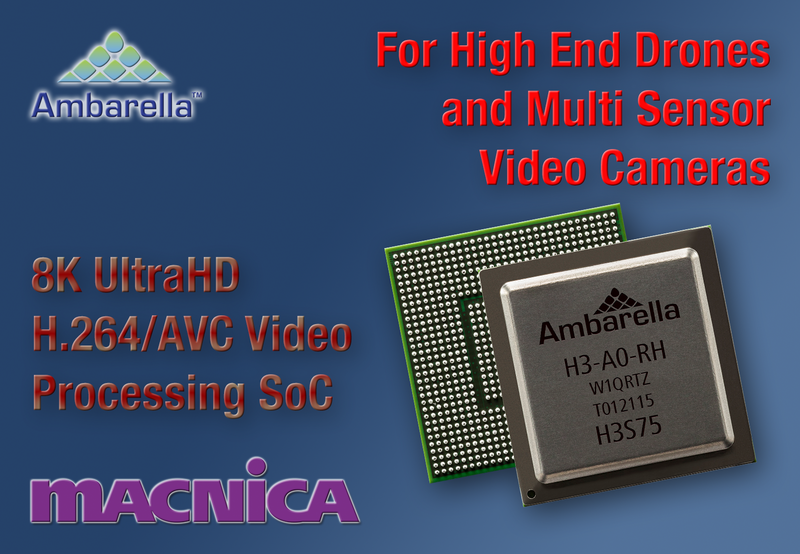 SANTA CLARA, Calif., January 5, 2017 — Ambarella, Inc. (NASDAQ: AMBA), a leading developer of low-power, HD and Ultra HD video processing semiconductors, today introduced the H3 System-on-Chip (SoC) for high-end drones and a new generation of video cameras, including 360-degree and virtual reality cameras. The H3 video SoC enables 8K Ultra HD H.264/AVC video at 30 frames per second, as well as multiple video streams with equivalent performance, including 360-degree cameras with dual 4KP60 sensor video capture. 8K videos played on large 8K displays provide a better viewing experience to the end user, as pixels at this resolution are indistinguishable to the human eye at any reasonable distance. The combination of 8K video capture together with Ambarella’s advanced oversampling and image stabilization also enables higher video quality 4K video recording. H3 includes a powerful multi-channel ISP for 360 degree video capture and multi-sensor drone applications. Its 10-bit HEVC High Dynamic Range (HDR) video processing handles high contrast and wide color range scenes. It also features Ambarella’s advanced Electronic Image Stabilization (EIS), capable of generating a smooth 4Kp60 video output under challenging conditions, including during high winds and with high degrees of rotation. The integration of a quad-core ARM® Cortex®-A53 CPU with floating point and NEON™ provides significant processing power for customer applications including computer vision, wireless networking, and multi-sensor stitching algorithms. The H3’s hardware de-warping engine supports wide-angle panoramic camera designs and fish-eye lenses. All brand names, product names, or trademarks belong to their respective holders. Ambarella reserves the right to alter product and service offerings, specifications and pricing at any time without notice. © 2017 Ambarella. All rights reserved.